A $22 million joint investment by the provincial and federal governments will allow Kwantlen Polytechnic University to begin work on a major overhaul of the Spruce building, which hosts the Surrey campus’ fine arts and science facilities. Construction will begin in April and will be completed in Spring of next year. “It’s good to see the provincial and federal governments coming together and doing the right thing by KPU,” says President Alan Davis. The announcement was made on Friday, Feb. 10 at an event held in the Spruce building bio lab, which is one of the facilities that will see major upgrades. The event was attended by Davis along with student and staff representatives from the Faculty of Arts and Faculty of Science and horticulture. Also at the event were representatives of the provincial and federal governments including Surrey-Cloverdale MLA Stephanie Cadieux and MP for Surrey-Newton Sukh Dhaliwal. The majority of the $22 million investment comes from the British Columbia provincial government, which will be contributing $14.7 million. The federal government will contribute an additional $7.3 million as part of the Post-Secondary Institutions Strategic Investment Fund. In it’s current state, the Spruce building is not a point of pride for the university. As one of the oldest buildings on campus, Spruce has not seen significant changes since Kwantlen’s community college days. The hallways, labs, and classrooms feel cramped, and cut off from the rest of the campus. Behind the building is a peripheral courtyard which, due to its isolated location, is underutilized. The boxy, concrete exterior of the building stands in stark contrast to the cleaner, more modern and presentable look of the campus library next door. The change in atmosphere will be welcome among students and faculty that have to spend significant time in the building. “Air quality is very poor [in Spruce]. We don’t have very good control of the temperature, and I think there’s been some water ingress, so I think it really needs to be gutted and rebuilt,” says Sherry Wilson, chair of the KPU biology department. The renovation will give Spruce a more modern “clean lined” design. The building will be expanded to fill the courtyard, which currently exists behind the building, and will allow space for a large atrium to function as a study/gathering space. The new design will be more open than the current narrow corridors and allow for more natural lighting. “It’s going to look like a modern, attractive building both for the neighbors who live next door to us and for us as an institution,” says Davis. “I think [students will] be more attracted to the building and there’ll be more open spaces where they can actually study so I think they’ll feel a better connection to the actual labs and courses that they’re taking there,” says Wilson. The Fir building, which is connected to the Spruce building, will be largely unaffected by the construction. In the early stages of the plan, there was some debate on whether to renovate the Spruce building or to tear it down all together and rebuild from scratch. Ultimately, according to Davis, the university opted to renovate because part of the requirements for a plan to qualify for the Post-Secondary Institutions Strategic Investment Fund is that the process must be completed by March 2018, due to the federal government budgetary cycle. It was decided that the demolition of the existing structure and ground-up construction could not be completed in that timeframe. Still, the decision to renovate rather than to add a new building is somewhat controversial for Science faculty who have been hoping for years that the university would invest in a whole new science building. KPU recently launched two new science degrees and has had space issues particularly for upper level classes. Davis says campus disruption caused by the construction process will have minimal impact on students. There will of course be classes shifted around to other locations on campus as renovations take place, but Davis is confident that KPU’s Director of Space Management will be able to make the process as painless as possible. “It’s hard on students and instructors, but I think that everyone understands it’s a sacrifice worth making for much better facilities when they’re ready,” says Davis. In addition to the new student study and gathering space added, the renovations will see major upgrades to program-specific facilities. Science labs will see improvements and the fine arts programs will have larger spaces in which to work and display finished artwork. The renovations will also add new studio theater facilities. The upgraded spaces in the Spruce building will allow for new programing at KPU. Davis says that greater space in the science labs will allow the Department of Science and Horticulture to offer more upper-level science courses in a given semester. Perhaps most interestingly, the additions of the studio theatre facilities will allow the university to offer a performing arts program. Davis stresses that the plans for this performing arts program are currently in an ”exploratory phase” and that nothing has been finalized or approved by the university regarding performing arts. However, Davis recognizes that there is significant community interest in such a program, and this new investment creates an opportunity to make the idea a reality. The Post-Secondary Institutions Strategic Investment Fund is a $2 billion initiative set up by the federal government to invest in academic infrastructure projects across the country over the course of three years. Not to be outdone, the B.C. provincial government matches that investment for projects within British Columbia. Other projects made possible by these funds include a $40 million dollar investment to UBC Okanagan for a new teaching and learning centre, along with other infrastructure upgrades, a $126 million energy systems building for SFU Surrey, $80 million for new undergraduate life sciences laboratories at UBC Vancouver, and over a dozen other multi-million dollar projects in British Columbia. 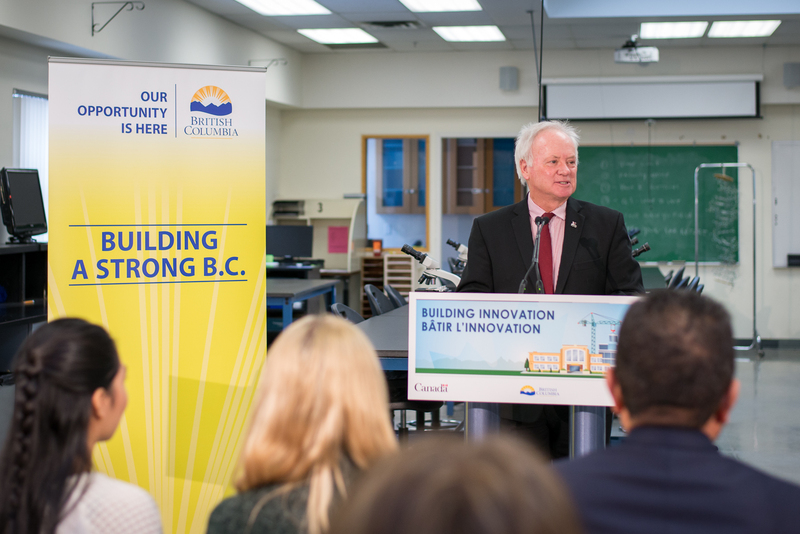 “The federal priority was an innovation agenda to make sure that we’re training people for the economy of tomorrow, and the provincial priority is, of course, to make sure that students are getting the education they need close to where they live,” says British Columbia Minister of Advanced Education Andrew Wilkinson. The Spruce building renovation was one of seven projects pitched by KPU for this funding early last year. Other projects that the university had in mind included a clean tech accelerator facility at the Cloverdale campus, which would have been a joint venture with SFU and would have allowed KPU industry partners to develop clean energy technology. There were also renovations on the Richmond and Langley campuses considered. All of these projects are still on the table to be funded via other means.